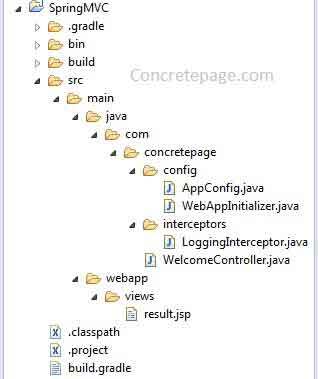 In this page we will learn spring MVC RequestMappingHandlerMapping interceptor annotation example. RequestMappingHandlerMapping scans all @RequestMapping annotations in all controller classes. It provides a method setInterceptors() to add interceptors. We cannot set path pattern here but can be set order of execution. Find the example. Find the required software and tools. RequestMappingHandlerMapping automatically searches for @RequestMapping annotations in all controller classes annotated with @Controller. In java configuration class, we need to implement WebMvcConfigurationSupport.requestMappingHandlerMapping(). If we annotate our class with @EnableWebMvc annotation, we need not to extend WebMvcConfigurationSupport. To add interceptor, it provides a method setInterceptors() . We can add more than one interceptor. We cannot assign path patterns here. They work for all patterns. We can set order of interceptors using setOrder() method. We are creating one interceptor class using HandlerInterceptorAdapter. And find the output in console.